Hi again, to all my faithful friends and followers. So, how are you doing with your writing. Did last week's post teach you what not to do? I ran my review past the author of the novel I was reviewing and she agreed with my rating of 3 stars out of 5 and understood why: that I wasn't trying to be critical, but helpful. Maybe she's following this blog??? If so, I'd love for her to comment. This week, I'm going to talk about what it takes to be a best-selling author. A long time ago, 1972, Dean Koontz published a very helpful book titled: "How to Write Best-Selling Fiction." I cut my writerly teeth on that book and wish I had a copy of it, even today. But I did take some notes that have helped me a great deal. Over the weeks I'll share some of them with you. The first notes I have, he quoted his high school teacher who said the following: "The average reader demands eight things of a novel: 1) a strong plot; 2) a great deal of action; 3) a hero or a heroine or both; 4) colorful, imaginative, and convincing characterizations; 5) clear, believable motivations; 6) well-drawn backgrounds; 7) at least some familiarity with the rules of English grammar and syntax - the more familiarity the better, of course 8) a style which embodies at least a trace of lyrical language and as many striking images as possible, for good writing is always vivid and visual." I could write a college thesis on each of those subjects. Maybe I will go over them in greater detail in the coming weeks. I think they give a lot of food for thought - to spin a cliche'. One thing Mr. Koontz didn't cover was how publishing has changed from the old find an agent who will find a publisher for you. Today, agents are still around, but difficult to find, and most traditional publishers these days require authors to do most of their own marketing, and independent self-publishing requires writers to do pretty much the same (a lesson I still haven't digested). Take a close look at the list of eight things readers demand and see how they can help with your writing. In the meantime, please "Share" and "Like" this blog post on Facebook , and "Retweet" it on Twitter yet. Also have you signed up for my email letters on my Blog Site? I would love to see you there and have you introduce yourself and give comments to my posts. And also keep in mind "Bridgetown High" is still available on Amazon, Goodreads and Barnes&Noble and a few other places I can't remember. 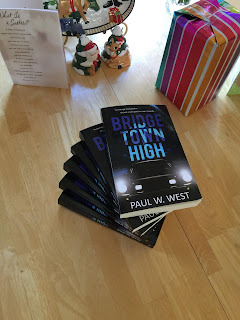 You can read some GREAT reviews of Bridgetown High on all of these sites.